It was quite cold and humid this morning, forecast expected rainy weather for today, but HOW my clients from Hot Australia was excited, when it started a snowfall with quite big flakes (click on the picture to enlarge it)! Of course, Tom and Kerry not felt comfortable in such bad weather conditions (0..+2 C, rain with snow), they not used to this climate conditions, but Tom was so excited to see the snow first time in his life that he even forgot about his frozen fingers at the moment! With this news I would like to say couple of words about my clients.. Tom is an airplane modeler, fun of aviation (as he told me - "As many of my friends I am nuts of aviation") and finally his long-standing dream came true - on April 15th he took a flight on famous Russian military supersonic jet MIG-29 in Nizhny Novgorod. This adventure for him was organized by Incredible Adventures company and the flight lasted about 40-45 min. On the late evening (April 15) he already returned back with Karen to Moscow. By the way, you can see right now his photos, which were taken at the Sokol Aircraft Plant in Nizhny Novgorod here: Incredible Adventures customer photos. As about Kerry, she likes history very much, and they are both very eager to learn more about Russia plus they are very nice, communicable people and very thankful listeners. Tomorrow morning we are going to see Armory Chamber and Diamond Fund in Moscow Kremlin and our tours for the second half of this day will depend on a current weather. On Saturday we planned to make shopping day and visit Izmailovo Crafts market with exciting tour to museum of Russian Bells, State Tretyakov Gallery (Russian art) walk up and down the famous Old Arbat street. 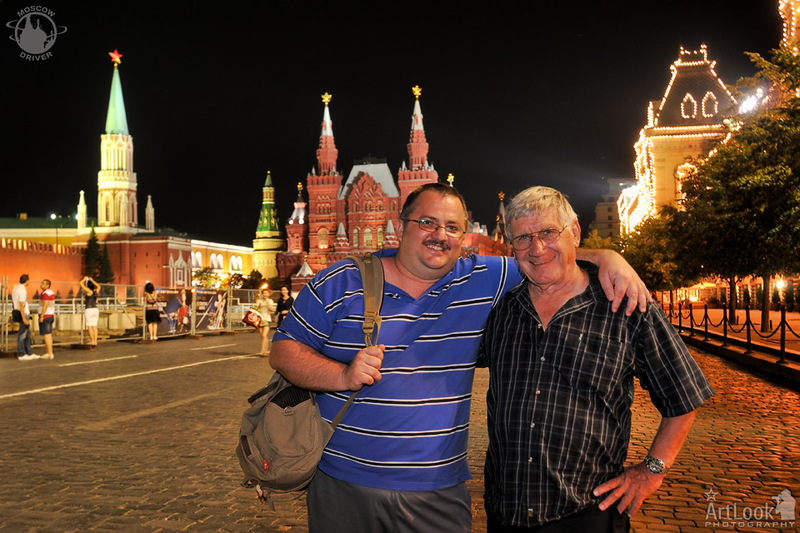 On the last evening, as usual I recommend for all my clients, I planned the popular Moscow by Night tour to say "See you again the capital of Russia", before their departure on the next day. PS: A bit later, when I will have more free time, I will post more information about Air Force museum with the best pictures of aircrafts and helicopters which I took this morning. Also, after receiving permission, I am planning to post a picture of Tom and Kerry at the special page dedicated to �My Dear Clients�.